Dr. Howard Bio Publications Testimonials NewFace Foundation, Inc. The plastic surgery procedure to correct saggy eyelids is called a blepharoplasty. 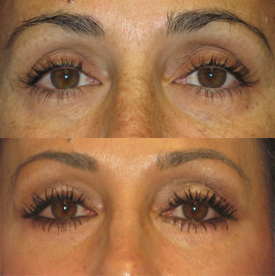 Eyelid lift surgery is often also referred as eye lift surgery. This operation is known for giving people a more youthful and rested look by removing the excess skin and fat around the eyes. This operation may be performed on the upper eyelids and lower eyelids separately, at the same time, or in conjunction with another procedure (face lift or brow lift). You must realize it is impossible to repair every wrinkle and remove every line around the eye, but this surgery can be one of the most gratifying procedures a patient can have. The procedure is performed on an outpatient basis under local anesthesia with oral sedation, lasting approximately 1 1/2 hours, unless accompanying another procedure. The incisions for eyelid lift surgery are made after an anesthetic is injected into the eyelid area. The incisions are placed in the natural crease of the eye for the upper blepharoplasty and just below the lower lashes for a lower blepharoplasty. The incisions are placed so that your eyelashes will not be compromised. In certain cases, a lower eyelid surgery may be performed without a skin incision, the so-called transconjunctival blepharoplasty. 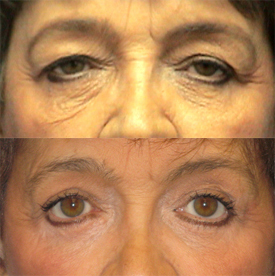 Most lower blepharoplasties require blending of the eyelid/cheek skin and addressing the tear trough deformity. The transconjunctival blepharoplasty is reserved for those people with normal skin, no significant skin sagging, and only fat bags requiring removal. An incision is made inside the lower eyelid on the conjunctiva to gain access to the fat bags only. Although this relatively new procedure may obviate the need to remove sutures and give a scar-less result, the recovery period, swelling, and discoloration may be similar to the routine blepharoplasty with skin incisions. 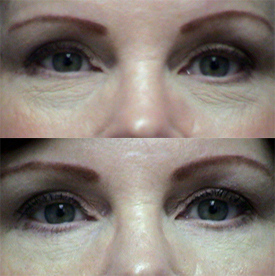 How is eyelid lift surgery done? Dr. Howard has been performing eyelid surgery under local anesthesia with oral sedation for over two decades in the comfort of his office. The outpatient procedure takes a little more than an hour to perform. Incisions are made in the crease of the eyelid for upper eyelid surgery and just under the eyelashes for lower eyelid surgery. The incisions for eyelid surgery are designed to blend in with the eye’s natural structure. The eyelid incisions are closed with a combination of absorbable and removable sutures. All of the removable sutures will be removed within a few days after surgery. The absorbable sutures will dissolve in approximately one week. After your eyelid surgery, an ointment will be placed on your incisions and cold compresses will be applied. It is important to keep your eyes hydrated with the specified eye drops post-operatively and to keep cold compresses applied as much as possible the first 48 to 72 hours following surgery. Cold compresses may still be necessary for up to a week following surgery. You must wear sunglasses when outside of your home to protect your eyes from the sun and eye strain until you are healed. The sutures are absorable and sometimes Dr. Howard may decide to use non-absorable sutures that will need to be removed three or four days after surgery. Most patients take at least one week off work to recover, but can also expect to still be hiding behind sunglasses for another week until bruising and swelling have subsided. 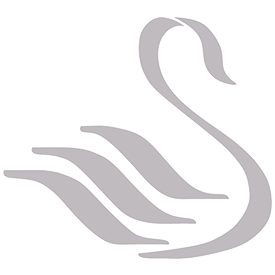 Make-up can be applied one week following surgery unless otherwise directed by Dr. Howard. The cost for eyelid lift surgery varies depending on if you require upper and/or lower blepharoplasty. Prices begin at $2750. It is extremely rare for insurance to cover this procedure for upper eyelids. Insurance will only cover this procedure if the patient has significant visual field obstruction. Your eye doctor must perform a visual fields test documenting this obstruction. The results of this test will be submitted along with photos and a letter from the doctor recommending the procedure to be covered as medically necessary under the terms of your health insurance contract. The terms of your insurance contract are between you and your health insurance carrier. Many health insurance contracts specifically state blepharoplasty as a non-covered procedure. Please refer to your health insurance contract for details regarding coverage. Dr. Howard, What are these dark circles under my eyes and what skin care product will help? Those dark circles are rarely a topical skin care issue. Dark circles appear as we age courtesy our not-so-favorite friend, gravity. Dark circles are the result of facial skin and underlying tissues losing elasticity and drooping along with the rest of your face. The worse case scenario is having all of the above problems as well as "staining" of the lower eyelid skin from broken capillaries, rubbing your eyes, and allergies causing this staining of the lower eyelids which can be permanant. The only true way to correct those dark circles is with a lower eyelid blepharoplasty blending those tissues back together, tightening the skin if needed, and addressing any excess fat. 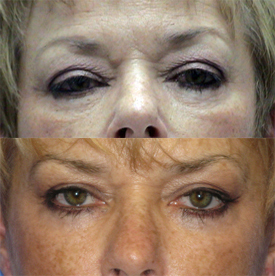 Notice in all of the eyelid surgery before and after photos below, all of those patients not only had excess skin, but had those lower eyelid dark circles pre-operatively. Dr. Paul Howard performs lower eyelid blepharoplasties to correct excess skin and fat, but also correct dark circles giving a more youthful and rejuvenated appearance. Patients can expect swelling and bruising around the eyes following eyelid surgery. Patients are instructed to use ice to keep the swelling down and help reduce bruising. This step is mandatory and should not be dismissed. Dr. Howard and his staff favor using cotton ovals soaked in a bowl of ice water. Allow the cotton rounds to soak in the ice water long enough to get very cold. Place the ice-cold cotton rounds over the eyes and keep them on until they are not long ice cold, then change them out. Repeat this around the clock for the first 72 hours following surgery. Patients will be given an after-care kit that includes an over-the-counter daily hydrating eyedrops and over-the-counter nighttime eye ointment to keep the eyes from drying out while you sleep. Patients are required to use these eyedrops. Failure to keep your eyes hydrated will cause your eyes to become dry and irritated. Symptoms of dry eye are: runny eyes, scratchy eyes, red eyes. Tearing eyes means that your eyes are actually DRY!!!! Your body is responding by over creating tears. While your eyes are healing, the swelling will cause them to become dry. Ignoring these eye drops will cause your recovery to be prolonged. You will heal very slow because your eyes will stay more swollen longer. If you run out of these eyedrops, they can be purchase at any local drug store. The night time eye ointment should be put INSIDE of the eye and will cause your vision to be blurry because it is an ointment that is intended to “coat” the eye through the night. Patients should expect to use these eyes drops for at least two weeks following surgery. Some patients may need to continue use longer depending on their healing. Please take us seriously about these eyedrops. Patients that don’t follow these aftercare instructions ALWAYS heal SLOWER and complain of eye irritation. Gift cards are available at our office or ONLINE.